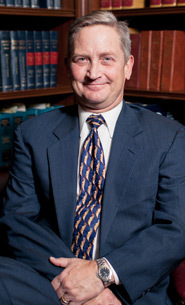 Jim has practiced law since 1995 and has extensive courtroom experience in Georgia. The son of a Navy surgeon, James Cavin was born at the Subic Bay Naval Base in the Phillipines and grew up in Las Vegas, Nevada. Jim attended the University of California Santa Barbara, where he received his undergraduate degree in Political Science. He earned his law degree at the California Western School of Law in San Diego. He was an Assistant District Attorney in Cobb and Gwinnett Counties for the first half of his career and then in private practice with the firm of Thompson, O’Brien, Kemp & Nasuti handling litigation and banking matters. Jim formed his own firm in May of 2013, Cavin Law, LLC. and continues to assist Smith Cavin & Corbin, LLC in real estate matters. Jim proudly served 21 years in the Marine Corps Reserves and retired in 2009 as a Gunnery Sergeant. Jim met his future wife Kristine while they were attending law school at California Western. They returned to Georgia to start a family and today juggle careers with raising 3 very active boys. A supporter of the Boy Scouts, Jim stays active in his local Cub Scout organization. In his leisure time he enjoys sports, hiking, gardening and camping with his family. Present: Founder, Cavin Law, L.L.C. Present: of Counsel, Smith Cavin & Corbin, L.L.C. 2006-2013: Thompson, O'Brien, Kemp & Nasuti, P.C. 1996-1998: Smith Ronick & Corbin, L.L.C. “ Jim is a fine legal thinker, writer and trial counsel with immense experience in the courts.